At the European Planetary Science Congress last month, I sat through a very interesting session on the future of nanosats in planetary exploration and astronomy. My curiosity was piqued by a talk about unfolding complex structures from cubesat-sized payloads (something that the Planetary Society is certainly interested in). 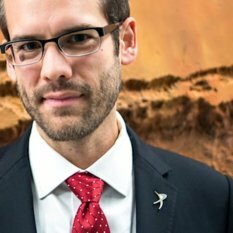 Dr. Franck Marchis is a Senior Scientist at the SETI Institute, and is working on the future concepts of what he calls "origami" telescopes from cheap nanosat technology. The basic concept is to develop a simple telescope payload with a deployable aperture, around one meter or so. Since these would cost on the order of $10 million, scientists can rapidly prototype and test various types of telescopes, and possibly even launch dozens into space at one time. The technology is in its early stages and the future is rich with possibility. I spoke with Dr. Marchis after his talk to learn more about this. CD: Today you were talking about origami nanosats, where these small satellites can unfold into something much larger once they’re in space. 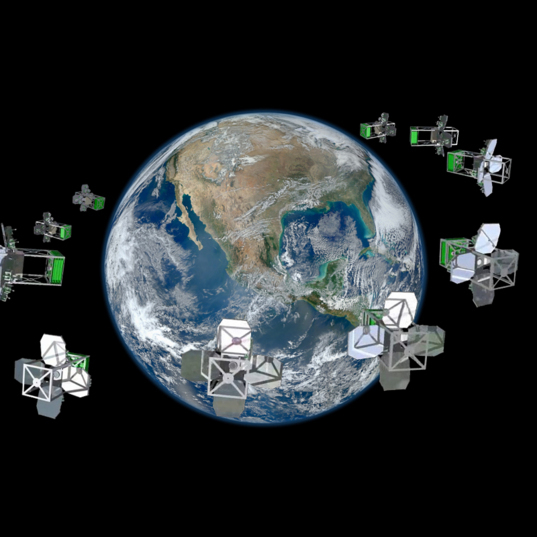 Why do you find the concept of cubesat tech so exciting? FM: Cubesats will open space to a large community. Right now, space has been limited to a small group of people; large industries and big universities. By having more partners we may get some new ideas, ideas that may help to overcome the challenges we have in space exploration. CD: Something that strikes me as one of the biggest cost-savings is that you don’t have to pay for an individual launch. You can hitch a ride with something else. FM: There’s also – since the mission is cheap – you don’t have the same fear of failure. That’s the main point of nanosats, you try – you build an instrument – and it may work for a few weeks, which would be less than you expected, but you can learn from it. And from this, when you build a 2nd generation, you can improve your design and find your point of failure, you can change this to make it more reliable. CD: It’s like a rapid-prototyping system you just can’t do with larger spacecraft. FM: Yes, I’m a ground-based astronomer, and this is what we do in ground-based astronomy. We build an instrument, put it on a telescope, maybe it doesn’t work the way it was supposed to, so we fix it, we improve some sensitive part, and then we get a reliable instrument that can be used for years by a large community of astronomers. CD: Tell me about these origami cubesats. What are some of the things you can do with a larger structure that unfolds into space? What are some of the technical challenges you face? FM: What we want to do is unfold an aperture, the primary mirror of the telescope. Currently, a nanosat cube is limited to a few centimeters in size. So the aperture of a regular telescope could only be five or six cm in size. What we want to do is deploy this aperture, and have a 0.5 - 1 meter telescope. If you have a bigger aperture, you have a more sensitive instrument, then you can detect fainter objects. CD: What is the advantage of having a small aperture telescope in orbit to a big, 10m telescope on the ground? FM: There are various reasons. You go into space to get rid of the atmosphere so even a 0.5 to 1m telescope in space will provide better resolution and better quality to the image. You have access to a wavelength range that you don’t have on the surface of Earth, like UV, for instance, or mid-infrared. And you also can snap together these tiny 0.5m telescopes to observe the same targets, and basically build a larger virtual telescope. Imagine you send something like 20 of these telescopes in space and you have them observe the same target and then combine the data. At the end you have the sensitivity of a 2.2m telescope, like the Hubble Space Telescope. CD: This is interferometry, right? FM: You can do interferometry, but you can also do just photometry as well. CD: How are you able to control the pointing of these telescope based on the small size of these nanosats? FM: That’s the key difficulty at the moment. We haven’t yet built a telescope to do astrometry. There are some projects, like one out of MIT called ExoplanetSat, that are basically building the key parts to do astrometry for these telescopes: the pointing accuracy and the stabilization of the nanosat itself. So we are waiting for them to do the work and see if it’s doable. Apparently there’s a new publication where they show that they can reach the accuracy that they need to detect the transit of exoplanets. CD: What about issues like ground communication. Are there issues with bandwidth? FM: So that’s the function of the orbit and the type of orbit of these nanosats will depend on the science drivers of the mission. That’s the reason I gave this talk, in fact. The point of my talk is that you first need to define the science drivers, to better define the concept of the nanosat: to determine the size of the aperture and the type of instrument. And then you will reach the point where we need to figure out how to communicate with these nanosats. There are different ideas, one of the most futuristic ones is if we have lots of nanosats around Earth in the future, we may have an array of antennas to communicate with those nanosats. And we can use technology that’s been developed for larger spacecraft like K-band communications, for instance. 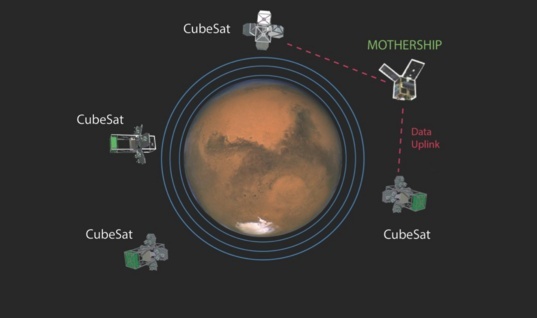 A network of cubesats could be deployed around Mars that depend on a larger "mothership" to relay data back to Earth. CD: Have nanosats with unfolding structures been tested in space before? FM: No. Unfolding a thin-membrane telescope has never been done in space. The closest we have so far is the unfolding of the solar sail spacecraft, like what the Japanese have done. This is one of the key parts of the technology, to find a reliable way of deploying these apertures. CD: So what kind of research is going on right now to support this? FM: A group at JPL is working on this. You see the video where they start from a 14cm telescope and deploy to 1.2m using a complex geometrical algorithm. This has been developed for solar panels, and now the idea is to use this for telescopes. CD: What are some of the ideas of what you’d like to see with these origami nanosats? FM: The obvious application for me is to search for comets and asteroids, to have a network of those around the Earth and be observing the sky almost continuously. We could also search for Earth-sized exoplanets around M-type stars. This is a key niche project for these type of nanosat telescopes. There are various applications in astrophysics, like a partial replacement for the Hubble Space Telescope. When the HST can no longer be used, we have to find a replacement in the UV, for example, and this instrument could potentially be a replacement for that. CD: How would that compare? HST uses a 2-meter mirror cost over $6 billion dollars. FM: We wouldn’t do a full replacement of HST. This wouldn’t be a large telescope with many different instruments. This would be one telescope with a simple spectrograph or a simple imager in the UV. Then copy this. Do like 10 of them and launch them into space and combine their observations to get a sensitivity in photometry equivalent to the HST for instance. CD: So you’re talking around $100 million for 10 of these to recover a part of that capability? CD: Do you see this as the future of space-based astronomy? FM: I would like the future to be like this. One of the reasons is because we’re short on money, but also because it’s a good way to think outside-the-box. If you look in the past, we’ve always used the same model for instruments in space: we want to build them bigger, more sensitive, with more cameras on them, and so on. This would be a different way of thinking about space exploration and making it available to a larger community of universities and other industry partners. CD: How far away are we from having the first deployable nanosat telescope? FM: [laughs] That depends on funding. If we had the funding now, I think we could launch the first deployable telescope in five years. ...an idea whose time has come!